05/11/09 GGGA3113 MEASUREMENT & EVALUATION IN EDU. Today is the 1st November. Crap. Tomorrow I'm going to sit for a major paper exam and another major paper on the following day. *Sigh* It's almost towards the end of the exam period - for me - because my last paper is on the 5th November. However, I will only be going back to KK on the 13th. Approx. 2 weeks more. I have been nocturnal for weeks now and that clearly explains the dark circles and the eye bags just below my eyes. Not forgetting, the multiplying mini volcanoes a.k.a pimples on my face. Hate it so damn much! Notice the eye bags? That's what you get when you stayed-up and only go to bed at around 4.30 - 5.00 in the morning. Seriously. What else do you notice? The hair? I have long hair and I tell you, it's always sometimes annoying and makes me want to cut it short. 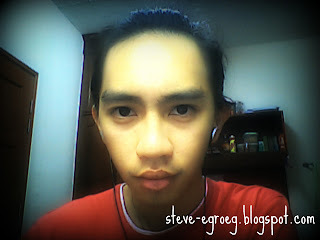 So, I tie my hair at the back everytime before I study. Problem settled. At this particular moment, there's no point embracing the long hair. After the exam perhaps? I am longing for a good comfortable rest. I really need it. Plus, I want to escape myself from these four walls surrounding me now. Wait. 3 more papers to go. I'm almost reaching the finishing line. ALMOST.